BPI Continuing Education (CEU) The EASY Way To Earn BPI CEU Credits! BPI Building Envelope Learn how to resolve problems related to the building shell, such as moisture, ice dams, mildew and drafts. BPI Analyst & Envelope COMBO Learn how to perform a comprehensive energy audit, provide work scope recommendations and resolve problems related to the building shell. The Building Performance Institute is recognized internationally as a leader in the building performance industry and continues to set the standard in the field. Through the credentialing of individuals and organizations, the Building Performance Institute ensures that a vigorous quality assurance program is maintained. BPI certification is for those working in the retrofit market for existing homes. BPI Building Analyst certification is the industry standard, and the starting point for most people who get a BPI certification. BPI Building Analysts are among the most highly respected in the industry. In addition, BPI offers several other certifications for various specialties. 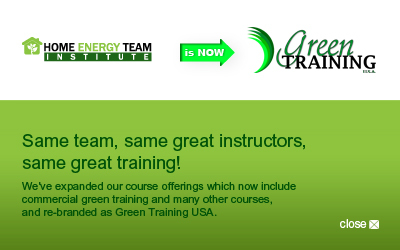 Speak to a Green Training USA Course Advisor to find out which training best meets your needs. Call 1-800-518-1877. BPI standards are recognized nationally across the US as well as internationally. As such, an increasing number of home energy professionals are opting to get their BPI certification in addition to their other qualifications. Many utility programs now require that consumers have audits and retrofit work (conforming to BPI standards) done by BPI certified analysts and contractors in order to qualify for their incentive or rebate programs. Other local utilities are offering discounts or reimbursement for energy audits and retrofits performed by BPI certified auditors and accredited contractors. Furthermore, a growing number of communities (Austin, TX and Montgomery County, MD for example) now require home energy audits by a certified energy auditor on all homes at the time of sale. In regard to BPI standards, this represents a tremendous opportunity for those analysts who are qualified to perform these audits.